lola's secret beauty blog: Sunday Sun Day Volume XXIV: Fake Bake for Sunless Bronzing and Luminizing for the Holidays! Sunday Sun Day Volume XXIV: Fake Bake for Sunless Bronzing and Luminizing for the Holidays! For many, as their glowing summer skin gives way to the paler shades of winter– they often seek a little extra glow or added color. Fake Bake has a wide range of products to add a little to a lot of color, and luminosity where there is little offered by the cooler days of winter. Their products are high quality and easy to use, and there is something for everyone in their vast array of sunless tanners, bronzers and luminizers. Here are but a few to consider if you are looking to add some oomph to your holiday season. 1) Beyond Bronze Self Tanning Mousse ($14.50 for 7.1 oz. from Amazon): Beyond Bronze Self Tanning Mousse is a fast drying, easy to apply super light weight mousse suitable for all skin types. The colour transfer resistant formula can be applied in the morning giving your the confidence to wear it throughout the day whilst the tanning agent develop. 2) Bronze on the Glow Instant Tan ($18.00 for 4 oz. from Dermstore): An instant tanning spray for the face and body. Fake Bake Bronze on the Glow Instant Tan adds a boost of color to your skin with temporary results. The formula goes on smooth and streak-free and can be removed in the shower without any residue left over. Simply mist it over your face or any part of your body and you will instantly see your skin with a natural-looking tan application. Includes a mitt for a smooth and mess-free application. Ingredients: SD Alcohol 40-B, Dimethyl Ether, Cyclotetrasiloxane, Cetearyl Ethylhexanoate, Isopropyl Myristate, Polyglyceryl-4 Oleate, PEG-8 Propylene Glycol, Cocoate, Isostearyl Neopentanoate, Iron Oxides, Canola Oil, Cucumber (Cucumus Sativa) Extract, Papaya Extract (Carica Papaya) Extract, Camellia Sinensis (Green Tea) Extract, Calendula Officinalis Flower Extract, Soy Lecithin, Synthetic Wax, Titanium Dioxide, Mica, Tin Oxide, Triethoxy Caprylylsilane, Fragrance (Parfum). 3) Ampify Daily Gradual Tan ($19.99 for 8 oz. from Amazon): Developed with cutting edge technology, the new Amplify Daily Gradual Tan by Fake Bake works on three levels to give a perfect year-round tan. An active plant based agent increases the skin’s melanin production, so it can be applied pre-sun exposure to give a quicker, deeper and longer lasting tan, while gradual tanners give a rich golden glow over daily use. Its luxuriously creamy but light formula also hydrates the skin with a skin-perfecting veil to blur minor imperfections. 4) Tanning Body Butter ($21.00 for 4 oz. from Dermstore): A hydrating body cream to prolong self-tan applications. Fake Bake Tanning Body Butter moisturizes and keeps a faux-tan application fresh-looking as it starts to fade. Infused with shea butter, it nourishes and protects the skin. Sodium hyaluronate seals in moisture and smoothes skin imperfections. Great for use in between tanning applications. Ingredients: Water (Aqua), Butyrospermum Parkii (Shea Butter), Dimethicone, Glyceryl Stearate SE, Cetearyl Alcohol, Ceteareth-20, Dihydroxyacetone, Stearyl Heptanoate, Glyceryl Stearate, PEG-100 Stearate, Ethoxydiglycol, Propylene Glycol, Cyclomethicone, C 10-22 Alkyl Phosphate, C20-22 Alkyl Phosphate, Dimethyl Isosorbide, Xanthan Gum, Erythrulose, Sodium PCA, Sodium Hyaluronate, Lactic Acid, Green 5 (CI 61570), Red (CI 16035), Yellow 5 (CI 19140), Phenoxyethanol, Tetrasodium EDTA, Fragrance, Benzyl Salicilate, Citronellol, Hexyl Cinnamal, Hydroxyisohexyl 3-Cyclohexene, Carboxyaldehyde, Linalool. 5) Tan Enhancing Lotion with Golden Glisteners ($16.00 for 6 oz. from Dermstore): A shimmering lotion for faux-tanned skin. Fake Bake Tan Enhancing Lotion moisturizes and helps extend the life of your faux tan application. Orange flower and calendula extracts condition while aloe soothes the skin. The smooth lotion adds a shimmering finish for a healthy and natural radiance. Ingredients: Water (Aqua), Propylene Glycol, Neopentyl Glycol, Diheptanoate, Stearic Acid, Cetyl Alcohol, Aloe Barbadensis Leaf Juice, Chamomilla Recutita (Matricaria) Flower Extract, Rosa Canina Flower Extract, Foeniculum Vulgare (Fennel) Extract, Sambucus Nigra Flower Extract, Calenduala Officinalis (Marigold) Flower Extract, Citrus Aurantium Dulcis (Orange) Flower Extract, Salvia Officinalis (Sage) Extract, Achillea Millefonium Extract, Geranium Maculatum Extract, Tocopheryl Acetate, Retinyl Palmitate (Vitamin A), Carbomer, Glycerin, Aroma, Triethanolamine, Polyquaternium-11, Fragrance, Citral, Limonene, Linalool, Mica, Iron Oxides, Titanium Dioxide (CI 77891), Red 40 (CI 16035), Yellow 5 (CI 19140). 6) Tinted Body Glow for Face and Body ($11.90-$17.90 for 2 oz. from Yes Style and Selfridges): Tinted Body Glow delivers that 'dewey-glowy-look' celebrities have been keeping a secret for years! A Triple pigmented tinted bronze that lasts from shower to shower, delivering that "dewey-glowy-look" designed for both face and body. Directions for use: Apply Fake Bake Tinted Body Glow in a circular motion on clean dry skin. Wash hands immediately after using. Allow to dry thoroughly before dressing. Can remove excess by lightly buffing with dry towel. Avoid water or excessive perspiration. Remove with warm water and soap. Ingredients: Water, Canola Oil, Cetearyl Alcohol, Cereareth-20, Stearyl Alcohol, Cetyl Alcohol, Dimethicone, Triethanolamine, Aroma, Carbomer, Tocopheryl Acetate (vit. E), Ascorbic Acid (vit. C), Retinyl Palmitate (vit. A), Propylene Glycol, Chamomilla Recutita (Matricaria) Flower Extract, Rosa Canina Flower Extract, Foeniculum Vulgare (fennel) extract, Sambucus Nigra Flower Extract, Calendula Officinalis Flower Extract, Citrus Aurantium Dulcis (Orange) Flower Extract, Salvia Officinalis (sage) leaf extract, Achillea Millefolium Extract, Geranium Maculatum Extract, Fragrance (Parfum), Mica (CI 77019), Iron Oxide (CI 77491, CI 77499), Citral, Limonene, Linalool. Overall Assessment: Fake Bake has a wonderful line of products, and anyone looking to add summer glowing skin without the sun should take a look at their products! You are right! 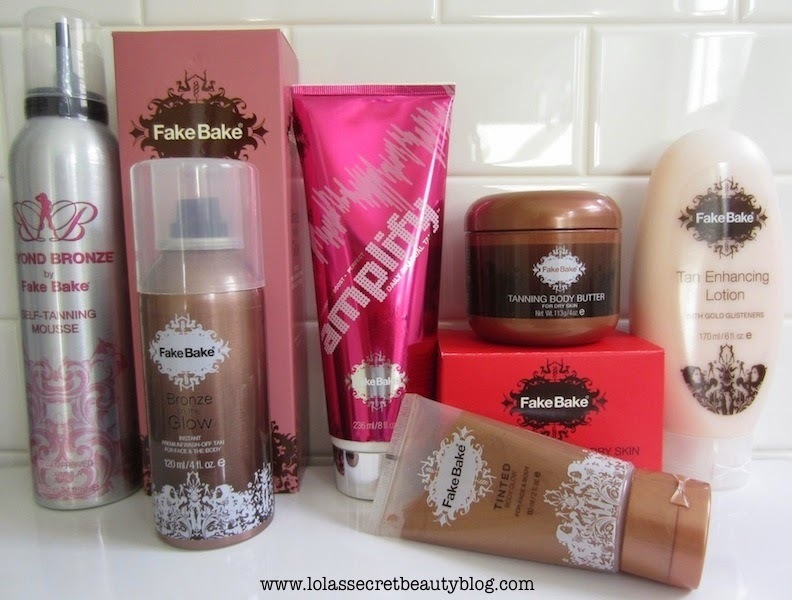 Fake bake has lots of wonderful products to try out. I wanna check on that bronze on the glow. These all sound like great products. Thanks for sharing about them! They really make great products! Fake Bake really makes great quality products, and they have nice bronzers that offer a little temporary glow as well as faux tanning stuff. It's definitely a nice line for people who do like to do faux tans! I don't know why, but I've always been too much of a scardey pants to try out fake tan. Hi Kristin, Fake Bake definitely makes high quality easy to use products. They also have nice temporary bronzers with a little shimmer for those who don't want to do the whole body faux tan deal! I'm not much of a tanner (at all) but I have used their tanning butter and really liked that it was natural looking on pale skin and super hydrating. Great roundup! Hi Bailey, I'm not much of a faux tanner either, but the tanning butter and Tinted Body Glow are really fun to use! I haven't tried Fake Bake but I've read rave reviews. I didn't know they have such an extensive line of bronzers! Hi Kath, They have SOOOO many cool products, and this is only a small sampling! THey make really lovely high quality easy to use products! I haven´t tried any Fake Bake products, but I´ve heard great things about them. Hi Leelo, They definitely make lots of great products! The only one I've liked 100% is from Beautisol. I love that this brand here has a lot to choose from! I haven't tried Beautisol before– but I almost grabbed it from iFabbo! Fake Bake definitely makes lots and lots of great options– including gorgeous Luminizers for people who don't want to do the faux tan! I am always so scared to use products like these - but since I do want to wear a pretty dress on Christmas, I might have to take the plunge! They definitely make easy-to-use products, and have such a wide range. It's definitely worth taking a look at their website to see if there is anything that grabs you! I've never tried Fake Bake since I tend to stay away from self tanners, but it's good to know their products work!